Officer Darnell Keel received a hero's welcome when his fellow officers surprised him with a standing ovation on his first day back to work. 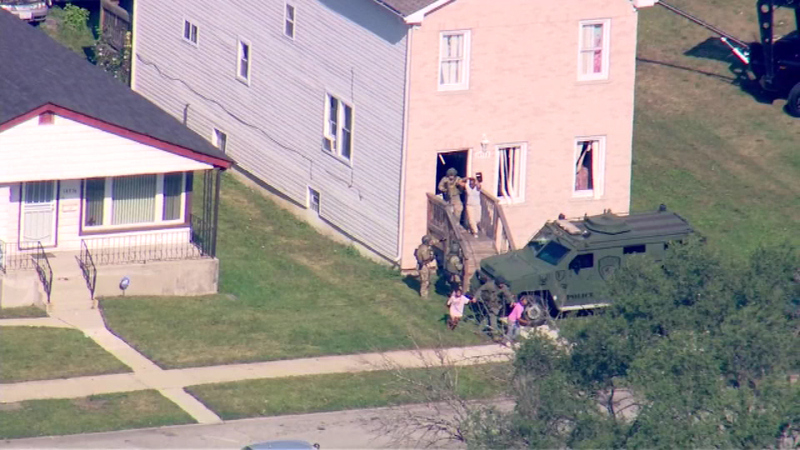 HARVEY, Ill. (WLS) -- A south suburban Harvey police officer is back on the job after he was shot last summer during a 21-hour hostage situation and standoff. Two men held eight people, six of them children, hostage during a 20-hour standoff in Harvey, Ill.
Lt. Darnell Keel received a hero's welcome on Tuesday when his fellow officers surprised him with a standing ovation on his first day back to work. "My first day back to work. I'm excited. I didn't know I was going to have all of this attention," Keel said. Keel was shot in the right arm after he pushed a rookie officer out of harm's way. The two officers were exchanging gunfire on a porch with two gunmen. The gunmen had broken into a home and were holding six children and two women hostage. "He could've retired, but he chose to come back to work to do what he loves. So when you have individuals like that who love their city, love their job, certainly we have to honor them and we call him a hero," Harvey Mayor Eric Kellogg said. Despite Keel's valiant efforts, he says he hardly feels like a hero. "That's part of the job. You know I've been in different positions in the police department and I always tell anybody, it's police work. That's what you get in the business for," Keel said. David Jordan and Peter Williams are charged with attempted murder of a police officer, home invasion and aggravated sexual assault in connection with that incident.